Balaji Ganesan bowling for Peterborough Town against Bourne in the Jaidka Cup Final. Photo: David Lowndes. ‘Can do better’ is writ large on Peterborough Town’s half-term report card. 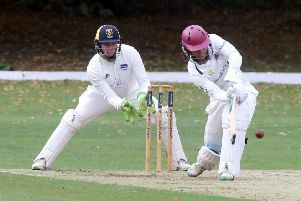 A thumping nine-wicket win at rock-bottom Wellingborough last week has left Town in third place, 29 points behind unbeaten leaders Old Northamptonians at the halfway stage in the Northants Premier Division. Pete Morgan batting for Bourne against Peterborough Town in the Jaidka Cup Final. Photo: David Lowndes. It’s a sizeable gap as it’s only 20 points for a win this season, but Town skipper David Clarke believes the pressure of the run-in could get to their rivals. “‘Inconsistency’, would sum up the season so far for me,” Clarke stated. “There have been glimpses of our full potential, but they’ve not been seen enough and they’ve not been seen at all in the bigger games. “But we have plenty of improvement in us and I’m not sure the teams around us can say that. Town travel to mid-table Wollaston on Saturday and they tested the city side on the opening day of the season before succumbing by two wickets. Town hope to have fast bowler David Sayer back from injury and if fit the teenager would also be recalled to Town’s Jaidka Cup Final team. Town host Bourne at Bretton Gate on Monday (July 11, 6pm) after the original game was washed out when intruigingly poised last weekend. Town were 68-1 from 6.2 overs chasing 134 from a maximum of 16 overs when play was abandoned. “It’s the right decision to replay the game,” Clarke said. “We were on top, but Bourne’s innings was interrupted when the rain first fell. Big local game in Cambs Division One tomorrow (July 9) sees second-place Nassington travel to Ketton (12.30pm), when Market Deeping host Grimsby in the Lincs Premier Division (noon). Deeping have conceded their Stamford Charity Cup semi-final scheduled for Monday (July 11) at Ketton. Ketton will now play Bourne in the final at Stamford Town CC next Wednesday (July 13). Burghley Park and Ufford Park meet in a Stamford KO Shield semi-final on Wednesday. The winners will play Ketton in the final on a date to be arranged. (noon) Premier Division: Oundle v Rushden, Wollaston v Peterborough Town. (1pm) Division One: Peterborough Town 2nds v Wellingborough Indians. Divison Three: ONs 3rds v Oundle 2nds. Division Eight: Oundle 3rds v Barton Seagrave. (noon): Grantham v Bourne, Market Deeping v Grimsby. (12.30pm) Division One: Foxton v Wisbech, Ketton v Nassington, Ramsey v Waresley. Division Two: March v W Colville, Saffron W 2nds v Newborough, Ufford Park v Sawston . (1.30pm) Premier Division: Bourne 2nds v Market Deeping 2nds, Sleaford 2nds v Long Sutton, Spalding v Woodhall Spa 2nds. Division One: Baston v Heckington, Billingborough v Moulton H, Grantham 3rds v Welby Cavaliers, Spalding 2nds v Freiston. Division Two: Boston 3rds v Pinchbeck, Claypole v Spalding 3rds, Long Sutton 2nds v Grantham 4ths. (1pm) Division One: Eaton Socon 2nds v Stamford, Godmanchester 2nds v Burghley P, Hampton v Castor, Ickwell v Ramsey 2nds. Division Two: Blunham 2nds v Barnack, Nassington 2nds v Bharat Sports, Peterborough Town 3rds v Buckden, Warboys 2nds v Orton Park. Division Three: Newborough 2nds v Huntingdon 2nds, Werrington v Hampton 2nds. Division Four: Brampton v Castor 2nds, Bretton v Falcon, Burghley Park 2nds v Ickwell 2nds, Great Staughton v Orton Park 2nds, King’s Keys v Ketton 2nds. (1.30pm) Division One: Market Deeping v Barnack, Oundle v Stamford, Peterborough Town v Nassington, Uppingham v Bourne, Wisbech v Ufford Park. Division Two: Ketton v March, King’s Keys v Grantham, Uffington v Castor, Whittlesey v Newborough. Division Three: Bretton v Burghley Park, Long Sutton v Werrington, Weldon v Wisbech 2nds. Division Four: Bourne 2nds v Easton Orton Park v Ramsey. Division Five: Castor 2nds v Weldon 2nds. Division Six: Hampton 2nds v Orton Park 2nds, Moulton Harrox 2nds v Huntingdon, Newborough 2nds v Whittlesey 2nds, Spalding v Ufford Park 2nds. (1pm) Division Five: Sheikh v Houghton & W.
(6pm): Peterborough Town v Bourne. (6pm) Semi-final: Ufford Park v Burghley Park. (6pm) Quarter-final: Burghley Park v Barnack. (6pm) Fnal: Ketton v Bourne (at Stamford Town CC).